A couple of months back, Dennis Yu stopped by and wrote a compelling post about understanding where your Fans are. He took a very unique approach to finding this information and gave some great tips for putting that info to work. Today, I want to take a step back. There is some very simple and easy to find demographic data that you need to know. And if you aren’t monitoring it now, you’re not doing your job. 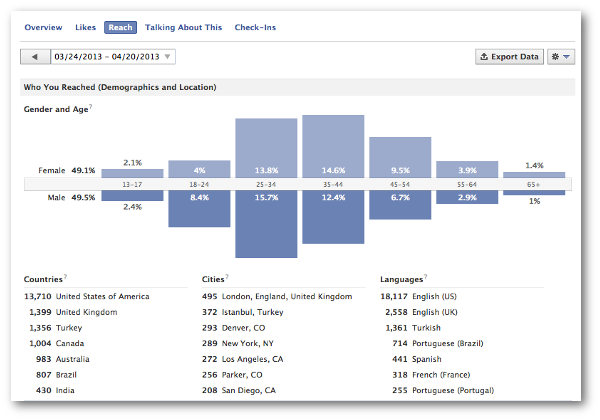 This is all lifetime data, so Facebook makes it ridiculously easy for you to make sense of this. The demographic data (particularly for Likes and Reach) that Facebook provides is one of the rare (only) times that I prefer web Insights over the exports. Your Page Level export includes this information as well, but it’s within countless cells and columns and it’s difficult to decipher. There are four tabs near the end of your export that provides this data. Is It Important? Well, kinda. Not really. Sure, it matters where your Facebook Fans are. But there are numerous reasons why this data could be close to worthless. Have you ever bought likes? That would lead to dead accounts. That would make this data worthless. Have you ever focused ads in certain countries only because the likes were cheap? That could lead to worthless results, especially if you targeted a bot-heavy country. Do you have Fans on the other side of the world, but you only post while you’re awake? In that case, it’s unlikely you get much reach or engagement from those neglected countries. Who are the people you actually reach with your content? Where are they from? Are they male or female? How old are they? This is the information that is found within the Reach tab of web Insights. Once again, I prefer this display to the Page Level export, which is simply mounds of cells, columns and rows. Everything you need to know about the people you’ve reached during a given week is right here. 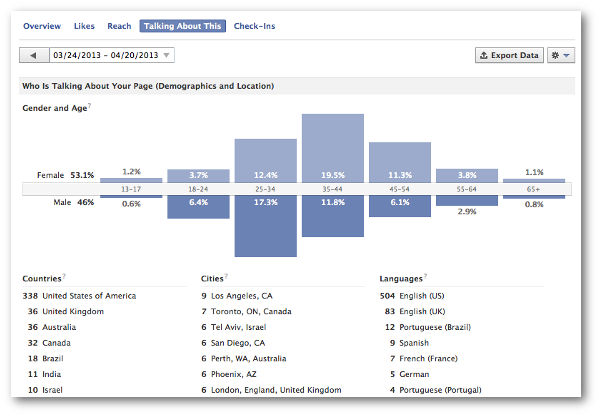 But you can find the weekly Reach demographic data within four tabs after the Likes demographic info. Weekly? Yeah, I know. Not real sure why Facebook only provides weekly stats on this. But they do. Is It Important? Sure, it’s more important than the Likes demographics, in my opinion. However, keep in mind that the people you reach includes non-Fans as well. So this data can get distorted in a hurry. Do you advertise a lot? 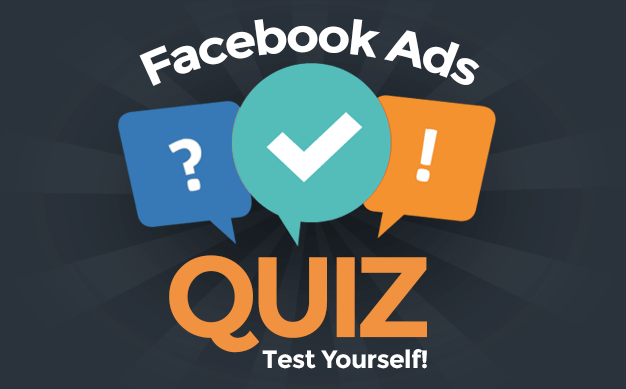 Is your advertising strategically focused? The answers will help determine just how valuable Reach demographics are for you. I’d be most curious about what your Reach demographics are for a normal week without advertising. Or several normal weeks without advertising. This is the type of information that can help determine how you craft your content for a target audience. This is what matters, right? You may have a bunch of Fans whom you never reach. And you may have a bunch of Fans you reach but who never engage. But how about people who actually create stories about your content? Once again, this includes non-Fans. And it can be skewed a bit with heavy advertising. But this is where you need to focus your attention. Since web Insights only provides weekly Talking About This demographics, I actually prefer the export this time. I prefer the option of looking at chunks by Daily, Weekly and 28 Days. 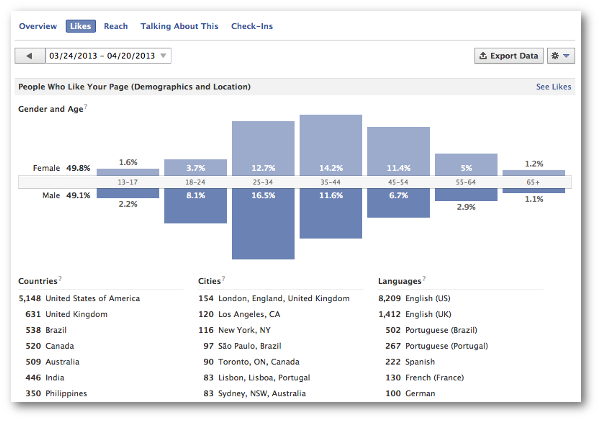 What’s interesting is that if you focus only on Likes demographics, Brazil is my third most popular country. If you focus on Reach, Turkey is third and Brazil is sixth. If you focus on Talking About This, Brazil is fifth and Turkey is nowhere to be found. Is It Important? Heck yes, it is! These are the people who engage most with your content. They not only engage, but they create stories to help your content go viral. You need to cater to these people! The most popular city is currently Los Angeles, but that sample size is so small that it’s insignificant. I should write more content that reaches people on the other side of the world. Part of the reason my Talking About This demographics are skewed the way they are is my own fault. I haven’t been scheduling content lately during my sleeping hours. I need to! Check your demographic data. What does it tell you? Let us know in the comments below!